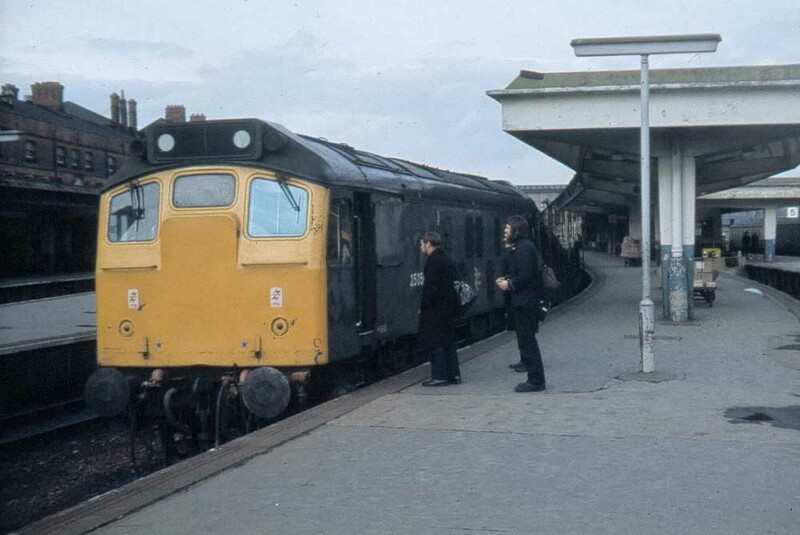 Photograph courtesy Russell Saxton 25050 waits for the crew change to be completed at Derby's Platform 4 on February 11th 1981. The locomotive has only very recently been transferred from Haymarket to Toton. During its twenty year career D5200/25050 was allocated to depots on the London Midland, Eastern & Scottish Regions. Dual brake equipped (September 1978). Time between last Classified repair and withdrawal: 55 months. September 1963 to Nottingham (16A). January 1965 to Midland Lines (ML). August 1965 to Gateshead (52A). August 1965 to York (50A) on loan. September 1965 to London Midland (Midland) Line (LMML). October 1967 to Wigan Springs Branch (8F). April 25th 1983 - withdrawn. 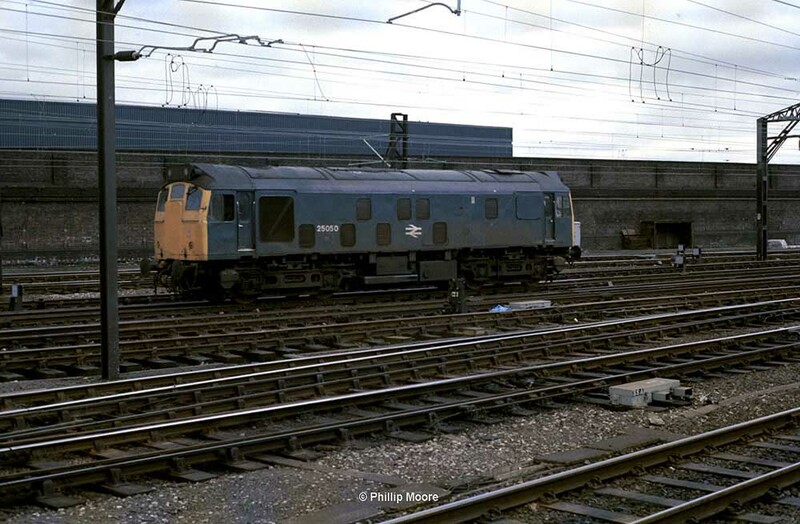 Whilst allocated to Cricklewood 25050 collided with 25033 at Birkenhead Mollington Street on April 22nd 1983. 25050 was withdrawn three days later. By the end of April 1983 25050 had reached Derby Works and remained here until moved in a large convoy of withdrawn locomotives to Swindon Works on February 4th 1985 and broken up there by early April 1985. Whilst at Derby Works the undamaged cab of 25050 was fitted to 25058. 25050 was the 175th Class 25 to be withdrawn, one of six retired during April 1983. The final movement of 25050 included 25050/062, 25129/133/146, 25220/233/274/294 9X12 Derby Works – Swindon on February 3rd & 4th 1985. 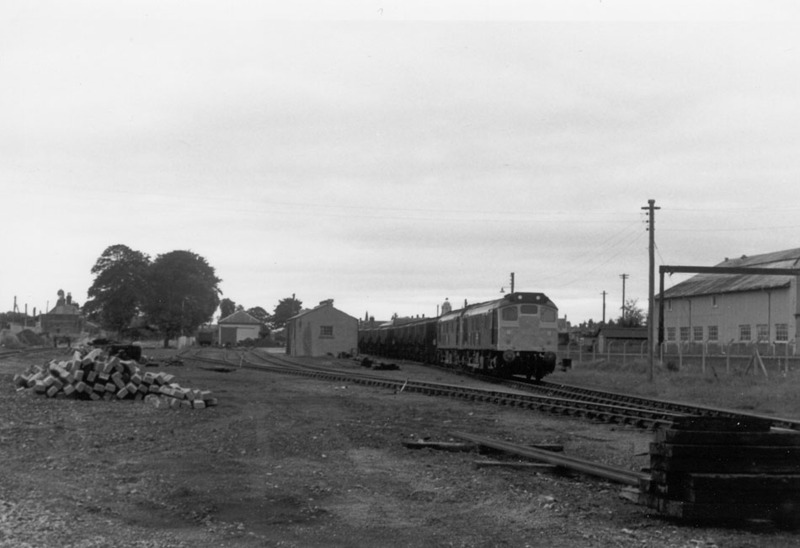 Noted Derby Works August 1968. Noted Derby Works August 1973. Noted Derby Works January 1975. Noted Glasgow Works June 1978 & September 1978 (classified included fitting of dual braking equipment). Condition October (at Derby Works): green livery with small yellow warning panels, curved upper corners, warning panel covers frame level stripe, blanking plates fitted, hand/footholds present, straight sided sandboxes, three-rung bogie mounted footsteps, engine exhaust located above engine room. Photograph courtesy Tony Sayer Thirty three months and sixty seven Type 2s separate the delivery to traffic of D5133 & D5200, which are seen together at Newton Heath depot on August 15th 1970. Although built to the same basic design the photograph details many differences between the two locomotives. 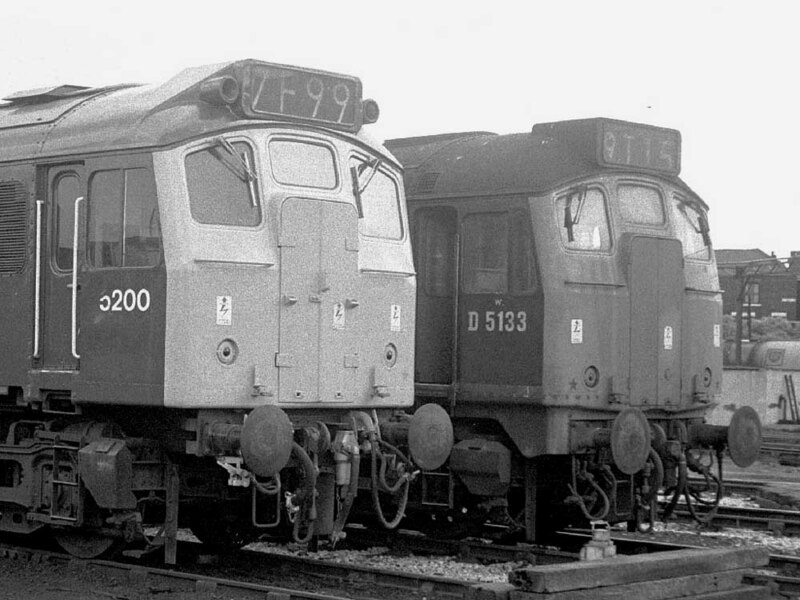 In particular the two large front cab windows of the D5176 onwards are deeper than the earlier Class 24 & Class 25/0s. On August 29th 5200 & 7676 worked the 09.20 Manchester Piccadilly - Yarmouth to Lincoln Central, returning from there with the 09.28 Yarmouth - Manchester Piccadilly. On June 17th 5200 & 5198 worked the 09.20 Manchester Piccadilly - Yarmouth to Lincoln Central, returning from there with the 09.28 Yarmouth - Manchester Piccadilly. A Cleethorpes - Aberystwyth excursion on May 28th was worked roundtrip Wolverhampton - Aberystwyth by 5190 & 5189. The 09.20 Manchester Victoria - Llandudno Town on May 26th & 27th was worked by 25050. On August 10th the 09.19 Manchester Piccadilly - Yarmouth to Lincoln Central and the return 09.15 Yarmouth - Manchester Piccadilly from Lincoln Central was worked by 25050 & 25054. On May 28th a Glasgow Queen Street - Dundee service (?) was worked by 25050. On October 8th the 23.05 Edinburgh - Perth (portion for 23.30 Glasgow - Inverness) was worked by 25050 & 25046. The locomotives then returned south to Carstairs to take over the Crewe - Fraserburgh WRC 'Spirit of the Barley' railtour between Carstairs & Aberdeen. Photograph courtesy Malcolm Roughley 25050 & 25079 working the 05.04 Craiginches Yard (Aberdeen) - Elgin at Inverurie early on the morning of July 27th 1977. On August 6th 26028 & 25050 were noted at Glasgow Queen Street on an unidentified working, on August 8th the same pair worked an afternoon Aberdeen - Edinburgh service. The failure of the 15.22 Dundee - Edinburgh on April 14th saw 25050 drag the service from ?? to Edinburgh. Passenger workings during 1979 featured familar internal Scottish turns. On February 11th 25050 was noted at Oban at the head on an unidentified service to Glasgow Queen Street. On the last day of February (28th) 25050 worked the 11.38 Dundee - Glasgow Queen Street and the 14.44 Glasgow Queen Street - Dundee. Three days later on March 3rd the 17.44 Oban - Glasgow Queen Street was worked by 25050 & 27012. 25050 was noted at Dundee on April 1st, having arrived with a freight. April 6th found 25050 working the 11.03 Perth - Edinburgh whilst on June 15th the 22.20 Perth - Euston was worked to Mossend Yard by 25050 & 25068. The 08.45 Edinburgh - Aberdeen was worked by 25050 on June 9th. The next day (10th) 25050 worked the 14.44 Glasgow Queen Street - Dundee and the 17.33 Dundee - Glasgow Queen Street. On July 1st 25050 worked a late evening Newcastle - Carlisle parcels. On July 10th, whilst many miles away from the Scottish Region, 25050 worked the 11.05 Manchester Victoria - Holyhead. On July 20th the 21.25 Dover Western Docks - Stirling motorail was worked north from Mossend Yard by 25050 & 27025. A Shrewsbury - Edinburgh day excursion was worked roundtrip Carstairs - Edinburgh on November 1st by 25050 & 25086. Towards the end of November (29th) 25050 worked the 07.39 Dundee - Glasgow Queen Street. Photograph courtesy Norman Smart 25050 is seen shunting at Elgin sometime during 1980. 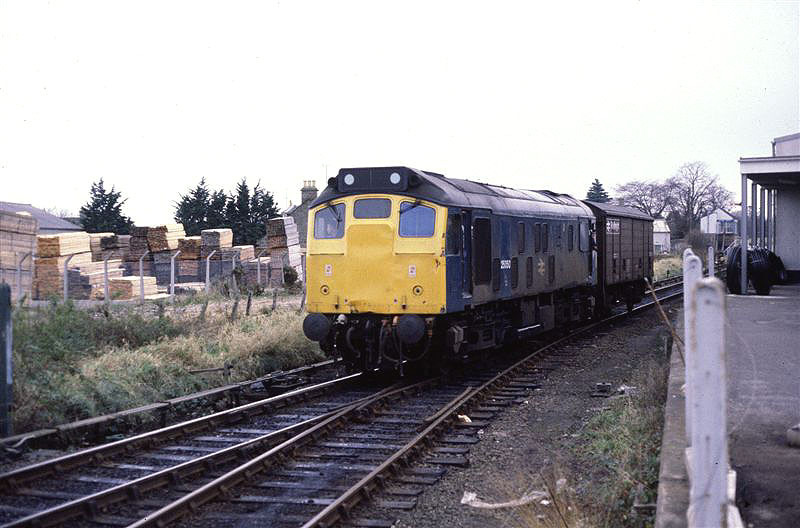 By February 1981 25050 had been transferred south to Toton, being noted on March 1st working the 02.25 Euston - Bletchley. On May 5th the 08.00 Leicester - Llandudno Town day excursion failed at Stoke-on-Trent behind 47353, 25050 & 25066 worked the service to Llandudno Town, returning throughout with the 19.20 Llandudno Town - Leicester. The Stanlow - Heysham Harbour oil tanks were worked by 25050 & 25213 on July 13th. On October 1st the 16.36 Birmingham New Street - Norwich was worked by 25050. Two days later on October 3rd 25050 was noted at York depot. 25050 & 25210 were noted at Northampton with a freight train on March 23rd. 25050 was noted at Appleby on May 14th hauling saloon TODM999501. A St. Pancras - Bewdley day excursion on April 24th was worked roundtrip Birmingham New Street - Bewdley by 25050 & 25199. On May 14th 25050 was noted passing through Appleby with a Divisional Manager's saloon (TODM999501). 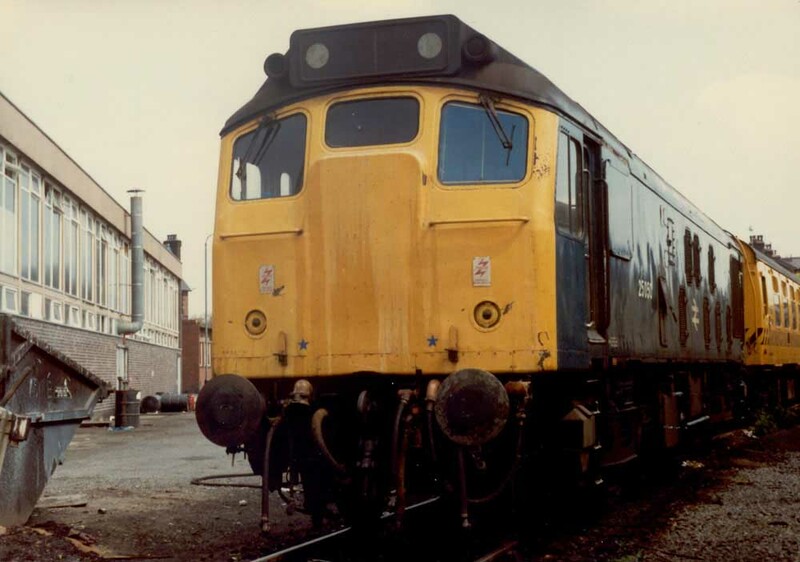 Photograph courtesy Jerry Glover 25050 alongside Newton Heath depot on May 16th 1982. On June 2nd 25050 & 25209 were noted passing through Newport (Mon) with a freight. 25050 was noted at Cricklewood depot on July 24th. During the middle of August in the week of August 16th 25050 worked the 02.10 Manchester Piccadilly - Cleethorpes, returning with the 08.40 Cleethorpes - Doncaster. The month of October saw 25050 handle its last passenger workings. On October 12th 25050 & 25048 worked the 08.20 Leeds - Birmingham New Street. Four days later (16th) the same pair worked the Euston - Liverpool HRT 'Pennine Perambulator' railtour between Bletchley & Toton. 25050 was stabled at Speke Junction on January 13th. Photograph courtesy Phillip Moore Crewe station, March 5th 1983. 25050 has about six weeks left in service before its collision with 25033. On April 22nd the working life of 25050 came to an end when it collided with with 25033 at Birkenhead Mollington Street. After movement to Derby Works the undamaged cab of 25050 would be fitted to 25058. 25050 was withdrawn on April 25th 1983. Page added March 29th 2012. Last updated March 6th 2019.